The difficult thing about the GP series is that each event comes at you so fast that you hardly get a break. I’ve been in a little bit of a slump lately so in an attempt to get out of that frame of mind, here’s a post with my thoughts on this year’s Skate Canada International. Nobody was really expecting Chan to lose at Skate Canada so the big story here is the faceoff between Yuzuru Hanyu and Nobunari Oda. You would think that Japan would be happy with the maximum 3 entries for the men’s competition at the Olympics but it seems as if the talent in this field runs deep. Every Japanese man worthy of the Olympics can’t make a false step during the early season – they need to give it their all but at the same time, not get injured and do well at all of their competitions to make a case for them to go to Sochi. 1. Yuzuru beat Nobunari but by a really small margin – 1.8 points. This means that at the moment, they’re pretty much evenly matched. I find that the GP series is less influenced by politicking purely because of how the roster is formed; it’s rare to see two rivals (like Mao and Yuna or Virtue & Moir and Davis & White) to be in the same competition together. Since every event only has at most 4 top competitors or teams in each discipline, and each of them likely to be from different countries (unless a competitor for some reason drops in the overall rankings like Oda who missed a season due to injury), there is less need to throw the national figure skating union’s support behind one skater. Until the GP final, that is. 2. Oda would’ve beat Yuzuru if he knew how to think on the fly. And possibly count to 2. No, seriously, Oda managed, yet again, may I add, to VIOLATE THE ZAYAK RULE WITHIN THE FIRST MINUTE OF HIS PROGRAM. You would’ve thought that by now, he would’ve remembered to tack on at least a single toe-loop at the end of that second 3T. You would think that he’d learn his lesson by now since he’s violated the Zayak rule about fifty times already. So, if Oda has finally passed Counting 101 and How Not to Violate the Zayak Rule 101, he might have a slight edge over Yuzuru but for now, we’ll have to see how the rest of the GP series goes before we can say anything more definite about the Japanese men’s field. There might’ve been an epic battle at Nationals this year to see who will be responsible for fueling American hopes for a long-awaited ladies medal (which might not come this Olympics either) but Gracie Gold lost her top spot in the long program and possibly, the chance to assert herself as the top U.S. lady going into the Olympics. Ashley didn’t win Skate America either but she already has last year’s National title under her belt and with her solid skating so far this season, I think she can secure the top spot at Nationals this year as well. So, PJ Kwong called this one correctly and 15 year-old Julia Lipnitskaia won the ladies’ competition over veteran Akiko Suzuki (yet again) and rising star, Gracie Gold. The only problem I have with Lipnitskaia is that I think her jumping ability is what is carrying her through to the top. The only problem with that, is that she doesn’t get off the ice very high and you can tell that she can squeak in an extra rotation on some of her triple jumps because of her small size. You see that ability to turn a double into a triple in a lot of junior ladies skaters but once puberty hits, that’s when you can’t squeak that extra rotation anymore. Especially with that really slow exits (which almost stop sometimes) on her jumps, I’m not sure if Julia’s jumps will carry her through in the next few season. At least for this season, though, I’ll peg her higher up in my rankings. Unless you’re completely deluded, you probably know that the gold and silver medals for the pairs competition at Sochi will likely go to Tatiana Volosozhar & Maxim Trankov and Aliona Savchenko & Robin Szolkowy barring injury or freak accident, with the former having a huge home-ice advantage. These two teams have been at the top since Shen & Zhao retired after their comeback at the last Olympics. The third spot has been open for a bit and last season Meaghan Duhamel & Eric Radford proved that they had what it takes to take the bronze. Consequently, everyone expected Duhamel & Radford to take the gold easily at Skate Canada as their main competitors Stefania Berton & Ondrej Hotarek and Wenjing Sui & Cong Han (who had missed a season due to injury) are somewhat in the B-list in pairs skating. What should have been an easy victory turned into a surprise bronze at Skate Canada, which begs the question: has Duhamel & Radford lost their grip on theOlympic bronze? We’ll just have to see as the season progresses. 1. There were bobbles, yes. On the quantitative side, we can also note that Kaitlyn Weaver & Andrew Poje, the #2 Canadian team, got higher TES in BOTH SEGMENTS of the competition. Meryl and Charlie – level 4s for everything except a level 3 on their no touching midline step sequence. Anna Cappellini & Luca Lanotte – All level 4s. Meryl & Charlie also scored higher on their FD at Skate America. 2. In terms of PCS, which is the more subjective score in skating, as well as a sort of reflection of the judges’ taste and preferences, Meryl & Charlie have slightly higher PCS in both segments when you compare their Skate America scores to Tessa & Scott’s Skate Canada scores. Less than a point or two separate the two teams. In short: the teams are in a virtual tie in terms of their PCS, which Meryl & Charlie having a slight edge over their training-mates. Despite all of this, do not despair, Tessa & Scott fans. The future doesn’t look that grim for these two, especially knowing their work ethic and determination. I think that we’ll get a nail-biting competition at the Olympics from this rivalry, which will be great. What did you think of the competition at Skate Canada this year? Let me know in the comments! In 100 Days, the 22nd Winter Olympics, held in Sochi, Russia, will begin! Skate Canada is upon us! Onwards with the predictions! I apologize for any typos, by the way. My house is really cold and my fingers aren’t cooperating with me at the moment. Chan + skating in Chanada = instant gold. Sigh. 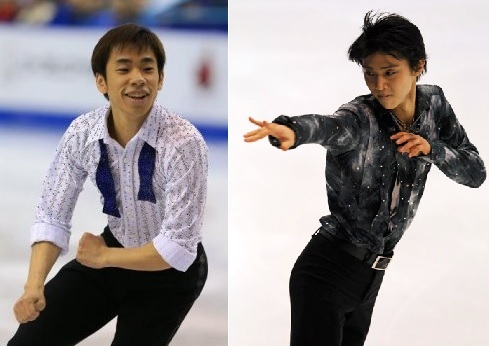 As for silver and bronze, expect a tough battle between the young prince, Yuzuru Hanyu, and his older teammate, Nobunari Oda. This is going to be a tough call. The ladies competition is another tough call. Little youngin’, Julia Lipnitskaia recently beat veteran, Akiko Suzuki, at the Finlandia Trophy. However, Akiko starts out the season a little rough and improves throughout the GP series. (After the GP series, she gets undermarked in the PCS and drops in the rankings at competitions…) As for Lipnitskaia, I really do wonder about her skating career. She may be winning the medals now but puberty is acoming and her jumps are frightfully low and she doesn’t come out of them with a lot of speed or flow. That’s a very bad sign for things to come when the ice and gravity is less forgiving once puberty sets in. I hate doing pairs predictions. Or pairs competitions in general. They’re just not as exciting or beautiful as they used to be. In any case, Meaghan Duhamel & Eric Radford are in a position not unlike Joannie Rochette 4 seasons ago: they’ll never touch the top two teams – S&S and V&T – just as Joannie couldn’t really touch Mao or Yuna but they’re better than the rest of the field, which is why their improvement in the rankings and skating ability is so exciting: they’re poised to take Olympic bronze. At Skate Canada though, they’ll probably take the gold. As for the rest of the medals, lets just say that these predictions won’t be pretty. Stefania Berton & Ondrej Hotarek let me down at Skate America by not getting bronze but I know they have it in them to get on the podium at GP events. I’m not a fan of their programs but they are lovely to watch. 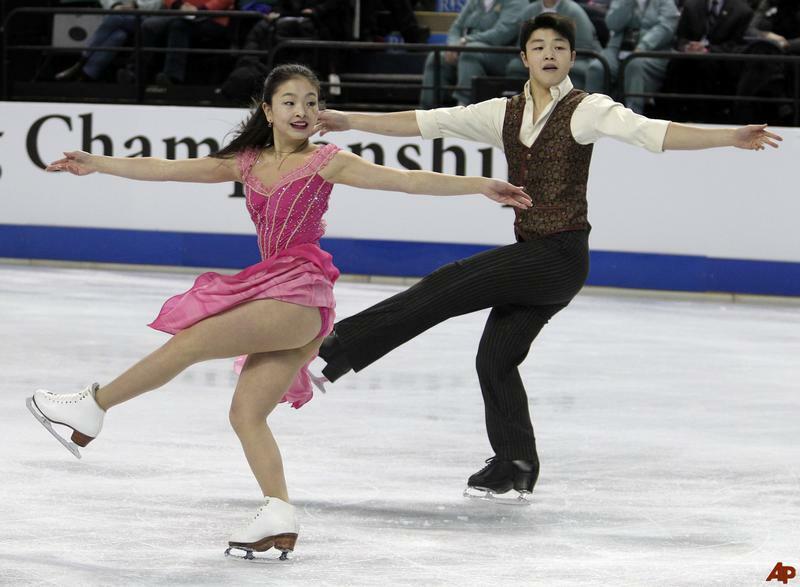 There was also a time where I absolutely adored Wenjing Sui & Cong Han but after missing a season, I’m not sure where they stand amongst their competitors, especially after a 12th place finish at Worlds. Another team to keep an eye out for: Paige Lawrence & Rudi Swiegers. I was quite impressed with Paige’s drive and competitiveness in the CBC documentary, “Ice, Sweat and Tears,” but I hope that it will translate into the team’s skating. Home-ice advantage will also give their scores a boost which might help them in their quest to medal. In all honesty, I’m not confident about these predictions beyond the gold. Just like their rivals, Tessa Virtue & Scott Moir will take the gold quite handily unless they withdraw. *hopes that that doesn’t happen* Their teammates, Kaitlyn Weaver & Andrew Poje, seems to have overcome their injury from last season and are skating strong as they have in the past few seasons. I expect them to get the silver. The bronze medal seems to be the tough call since there aren’t that many standout teams in this competition. If I were to hazard a guess at the bronze medal team, I’d say that it could go to Ekaterina Riazanova & Ilia Tkachenko, who medaled at two GP events last season (both bronze), which makes them a head above the rest of the list after the two Canadian teams. What are your predictions for Skate Canada 2013? Let me know in the comments!